It’s time to take user onboarding seriously. Most apps have some semblance of onboarding since they don’t want to throw new users into the deep end of their product. But too often, the answers to users’ questions are buried in an IKEA-esque manual somewhere deep in the product rather than where (and when) users need them most. Your acquisition efforts go down the drain if you have bad onboarding because your acquired customers will never stick around. To make sure this doesn't happen, here we've created a comprehensive guide to tried-and-true user onboarding best practices to build healthy retention numbers and keep churn low. In the last section, we've curated a library of our favorite user onboarding best practice resources from our customers, other companies, and B2B experts for further learning. Let's dive in. Customers bought or signed up for your product because they saw a promise in it. They learned from your website, a friend, or your description in the app store that they could get some value out of your app. User onboarding is your time to make due on that promise. It’s easy to make onboarding exclusively about the product—logistics, how-tos, and the nitty-gritty details about your product. But your onboarding still needs to be all about the customer. That starts by creating a seamless user experience centered around buyer personas and jobs-to-be-done to align the promise of your product with the onboarding experience. PMs need to understand what success looks like for each of these jobs and personas—why did they come to your app and what are they seeking to achieve? You need to frame onboarding around achieving that success. Here’s how a couple different apps have done that. Your marketing is different for each of your buyer personas. And if your onboarding is an extension of your marketing, buyer personas have a place in your onboarding. 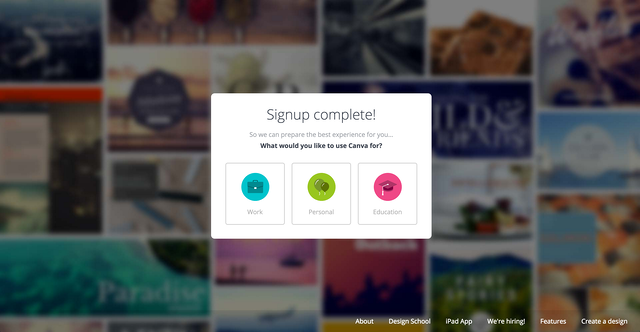 The design app Canva, for example, offers three options for users to select who they are (and why they’re on the app). Not only does it make the onboarding process feel personalized to the user by asking them about themselves, it allows PMs to segment the experience to the persona. If a user selects that they’re using Canva for work, it triggers a specific onboarding experience with templates for work-based design projects, like presentations or pamphlets. If they’re using the app for personal reasons, Canva’s onboarding experience might list sample projects like birthday invitations. Here’s how you can use Appcues for persona-based onboarding. One major onboarding faux pas we see is presenting new users with a blank slate. When you’re teaching a kid to write the alphabet, you don’t give them a blank slate. You give them a model of the goal, like a perfectly drawn “Q,” some dotted lines for them to trace the letter “Q,” and then, finally, they get to try on their own. They’re working towards a specific goal (the job to be done) and have the example right in front of them. That’s exactly what Basecamp does with their onboarding. They don’t have users start with a blank slate. They start with really specific job stories. Basecamp quite literally asks users what jobs they need done, and then takes them to a specific template for that job. If the job-to-be-done is a check-in, you can use this sample. If your job-to-be-done is messaging, go to the other. All new users play around with a sample Basecamp to learn the ins and outs, and then go on to make their own. Basecamp is able to use job stories to motivate customers to start building their own projects. It’s not a laundry list of all their cool tools and features—it’s centered around the customer and ties back to the messaging of why they signed up for the app in the first place. Beyond just outlining what they can get out of the app, users need to get a feel for it during onboarding. When the lightbulb goes off, users can start getting value from the product. This is called the aha! moment. Jobs-to-be-done is strategic. Aha! moments are tactical. So how do you actually identify your “aha!” moment? Here are the two best ways. Onboarding is about finding your best customers, then working backwards to figure out what actions they took early on. You can’t plan a great onboarding experience if you don’t know what your Aha! moments are. Once you’ve pinned those down, you can map out the entire user journey—onboarding and beyond. Amplitude is an analytics tool that gives PMs powerful insights into specific segments of their users, called behavioral cohorts. 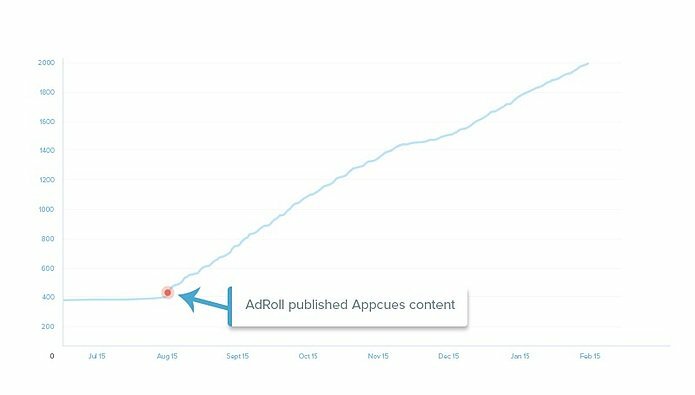 By looking at behavioral cohorts like “users who have signed on 3 or more times,” or “users who only spent 2 minutes on the app,” you can start understanding what’s sticky and what’s not. Equally important in onboarding is identifying your red flag metrics. What are the behavioral cohorts that don’t lead to stickiness. Amplitude also offers great visualization for the inverse of a behavioral cohort. 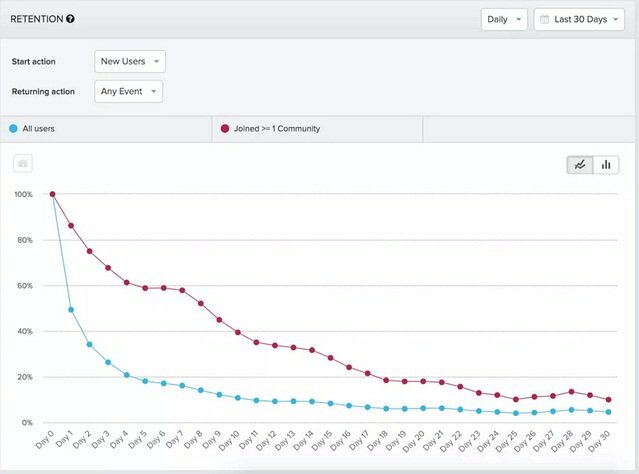 Here’s the retention curve for users who have added a community, and inverse: those who haven’t. If you don't have stat significance to run analytics, or if you're pre-product-market fit, there are other ways to get this feedback. There’s another way to hear about stickiness: by getting feedback straight from the horse’s mouth. Asking your users for feedback is a delicate dance. 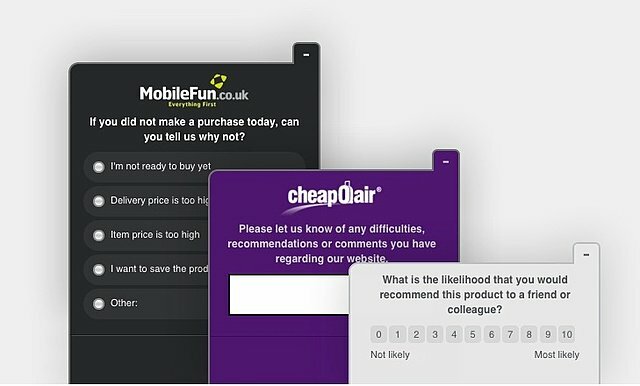 You don’t want to bother them with lengthy questionnaires, but you also want to get valid responses, not just a bunch of random answers from someone trying to get back to why they really logged on to your app. It’s a huge part of Sean Ellis’ growth framework, which is why he started Qualaroo. It’s an easy way of formatting your surveys (NPS or open-ended) and viewing qualitative answers in a quantitative fashion. It’s easy to ask a question like, “what was the first feature you started using” or “what’s the one feature you can’t live without,” and see exactly what percentage of your respondents say different specific features. Now that you know what it is, you need to map out the user journey. There can actually be multiple “aha” moments, since there are multiple stages for users. It’s a bit like this rollercoaster. 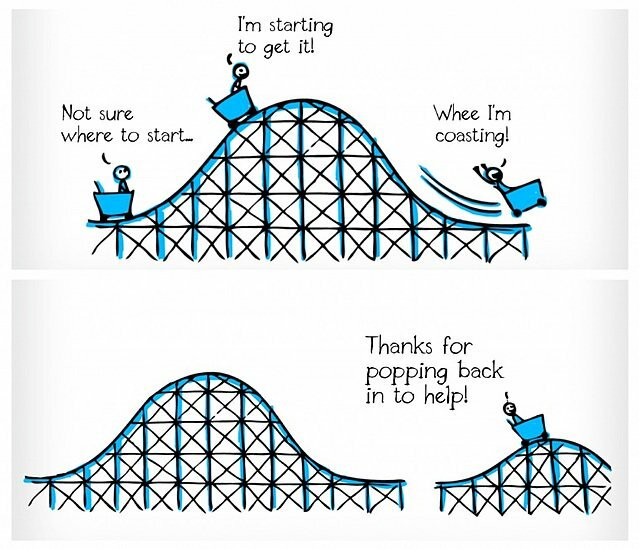 The first drop—the biggest aha!—comes at the beginning, but the ride doesn’t end there. It’s really important to map user journeys for every stage of the user lifecycle, much like this rollercoaster. Once you have those, it’s time to plot your map. For every stage, you need to keep users on track in your journey by mapping it out, and continuing to help them stay on the planned path. It’s important to generate early value for the user, and that means clearing the path. Your job is to remove snags and make sure users stay on course and shorten the time to aha! Answer questions right as they arise, use a chat app like Olark as a strategy for making users feel special. A lot of this involves removing barriers, which first requires identifying them. One way to do this is through user testing, which can reveal friction points you didn’t even know were there. By getting an unbiased third party to narrate as they go through your onboarding experience, you might learn about barriers you didn’t think were a problem. There’s even a guy who will do it drunk. If a drunk guy on his couch can get to the aha! moment, your sober users will, too. Sean Ellis stated that Twitter discovered something really powerful in cohort analysis about habit building: “once a user follows 30 people, they’re more or less active forever.” Analytics tools can help you uncover what your app’s version of this is, but the goal is to turn the product from a “once in a while” tool into an “everyday” tool. That’s going to take some nudging from you. In addition to emails, you can use Tooltips or push notifications to give users a nudge. The end goal is to just keep users coming back and making a habit out of the app. Sometimes this requires incentivizing using an app every single day, for instance, through a reward for using an app regularly. Long-term retention involves looking at the retention curve well past the first couple days. Instead, your job is to make sure that your old users—the ones who completed the first couple phases of your onboarding, are still there, still using the product, and continue to use whatever new features you release. 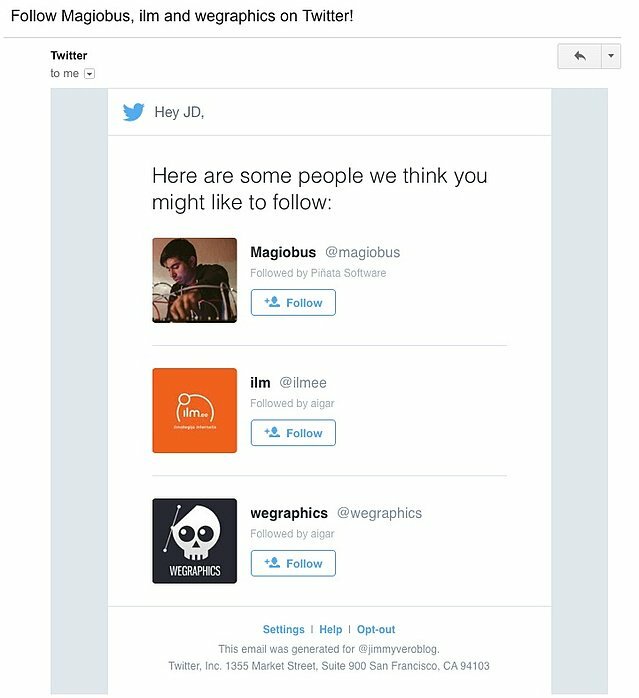 There are a ton of strategies to bring your inactive users back—it’s just a matter of testing out different strategies to see what works. If someone is straying from the path, try sending an email to prompt activity (or further activity). 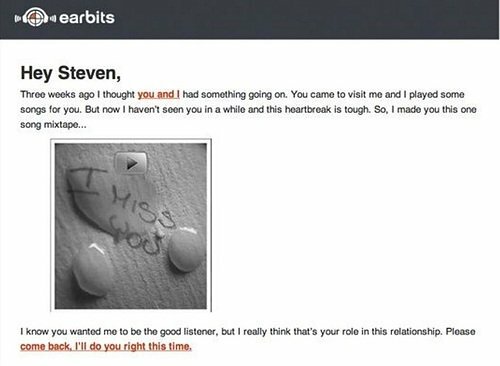 This re-engagement email from Earbits takes the “break-up” strategy to heart, but is really effective. Not only is it funny, it offers something of value—a mixtape—to incentivize coming back to the app. How can users get the most value out of this workflow while investing the least amount of time? You don’t want to bother your users too much, but you want them to actually finish the workflow and learn about your product. Finding that perfect balance is going to involve testing different UI patterns that employ different psychological techniques to get users to actually complete your onboarding workflow and get on with using the app. Here are some smart strategies you can start with. If you’re going to do an active product tour, it can’t feel like you’re leading users by the ear through an introductory activity. They have to want to complete it. Here’s how to create easy-to-use walkthroughs. 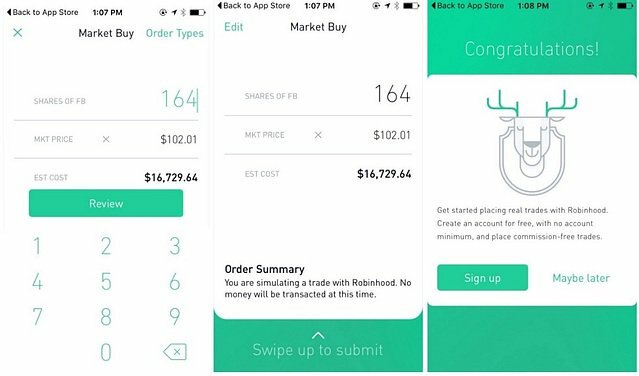 The app Robin Hood has users complete a “fake” purchase in their app tutorial. It allows them to get to the Aha! moment (even though it’s a simulated one) really quickly. It ends with a clear call to action to sign up, which removes friction. Watch out for: Never ending product tours. More than 5 steps in your product tour? You might want to cut some. Tooltips are a minimally interruptive way to get your point across. Since they’re triggered one at a time, it doesn’t feel like information overload—they just come up naturally as a new user moves through your app. 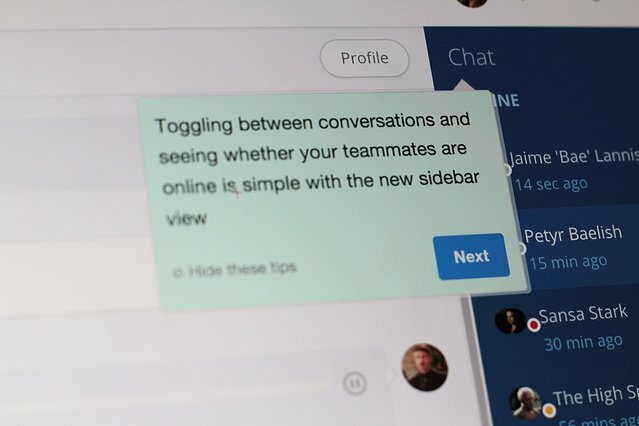 Action-driven Tooltips can also be really effective, especially in the early stages of onboarding. Instead of having an opt-out feature, action-driven tooltips require users to check a box or fill out a form before they can move on to the next stage. So if you’re looking for a way to capture information, or there’s a feature you really need users to understand, that might be the way to go. Watch out for: Overcomplicating the UI. Tooltips are all about simplicity. If you get too many in there at one point, it confuses the user and totally defeats the purpose. Progress bars and checklists tap into a very basic psychological principle: we care about completing things. A lot. It’s called the Zeigarnik effect, which states that we’re more likely to remember things we haven’t done than things we have. When users know exactly what’s expected of them in an onboarding workflow (and especially, how close they are to finishing it), they’re likely to keep their eye on the finish line and actually complete the workflow. This onboarding workflow from Process Street breaks its user guide into chunks, so new users don’t feel overwhelmed. They learn about Process Street (while using the platform), and feel like they’re making meaningful progress as they check off each chapter. Watch out for: An impossible to-do list. If you have a laundry list and that progress bar just barely inches forward as the user moves through your workflow, they’re likely to just give up. It’s far better to just set benchmarks, and encourage movement, than to overwhelm and see users drop off. Coach marks are fullscreen takeovers that can have really sudden effects on how users engage with your interface. Because they’re full-screen, they can explain a complicated UI with just a few tips. 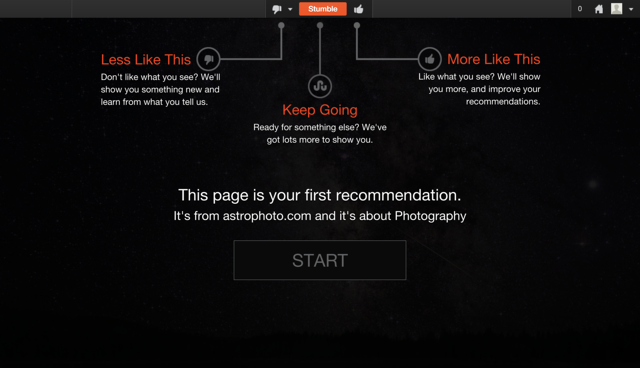 They’re especially great for minimal design interfaces, like this one from StumbleUpon. If icons don’t have labels, users need to learn what they are early on in their lifecycle. Watch out for: Too many coach marks in one screen. If the full-screen takeover gets too cluttered with arrows and text, it’s hard for users to know what to pay attention to. Try limiting coach marks to three per page. Modals have a lot of different use cases, but they combine aspects we love of coach marks and progress bars. They’re great for new features later in the user lifecycle, or during onboarding when a user is exploring a new feature of the app. Modals can be very powerful. 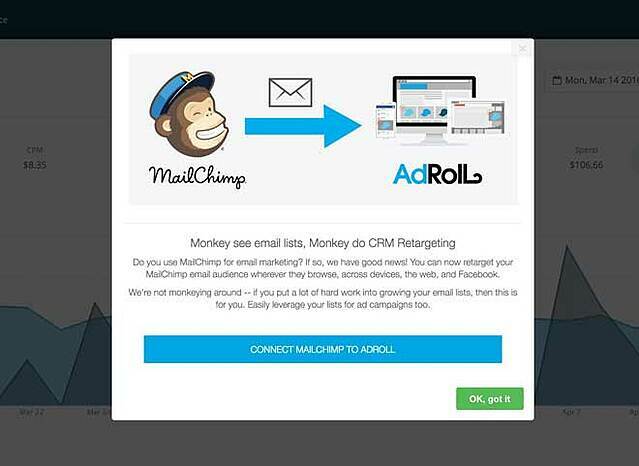 AdRoll communicated their MailChimp integration inside of their application to users of both platforms. This modal created a hockey stick growth curve tracing the adoption of their product integration. Watch out for: No opt-out. If users don’t want to do the tour now, they can do it at a later point. Opt in and opt out is crucial, since no one wants to be forced to do something they don’t want to do (even if it might help them in the long run). Study and master these tried-and-true onboarding best practices so can be sure you're executing on the most effective user onboarding in the game. The best user onboarding helps your users find your product's value quickly. But what does that actually look like in practice? And how do you begin building a user onboarding flow that does this successfully?These are the most comprehensive, catch-all playbooks for user onboarding when you need a place to start. These resources break down strategies and provide actionable steps for figuring out what's broken in your onboarding process and exactly how to make it ten times better. 76 Tips to Optimize User Onboarding [SlideShare]: This presentation—which we spent over 120 hours researching and putting together—is an overview of the best advice we've collected on user onboarding. It features strategies and tips from experts at five other B2B SaaS companies, including lessons learned from our own experiences and customers' experiences. How to Design for Trust and Keep Users Engaged for the Long Haul: Building trust with your users is foundational for driving retention—users have to trust that you're going to help them. This guide provides actionable ways to foster user trust through product and messaging. Lean User Onboarding: The best user onboarding may not going to be the first flow you build. To develop an onboarding flow that works best for your particular customers and product, you have to be dedicated to experimentation. This guide includes five of the best lessons in lean user onboarding principles. Great user onboarding will look slightly different for every product—but it helps to draw inspiration from those companies that are doing it with great success. Each of these companies has developed a process that works best for them, and along the way they've hit on key insights that every SaaS company can use to develop their own user onboarding best practices. The 5 “Best” User Onboarding Examples: There's no definitive best user onboarding because users' experiences vary so much from product to product. However, there are a lot of really outstanding ones that we can learn a lot from. This guide contains teardowns of the user onboarding experiences for Canva, Duolingo, Quora, Tumblr, and Slack. 5 Notable Changes Slack Made to its User Onboarding Experience: There's a reason Slack's user onboarding crops up often when we talk about best practices. Slack has achieved massively successful growth because it's able to quickly show users why it's so essential to their workflow and get them hooked on the product right away. 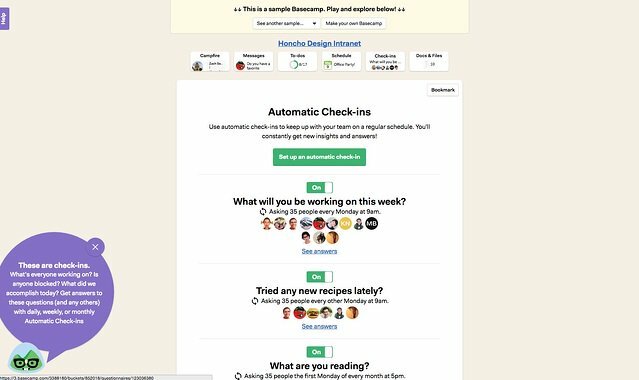 Here are the five most significant onboarding decisions Slack made to do this. The 20 Best Product Launch Emails That Reengage Users: Too many companies don't realize the importance of the product launch email. It can truly make or break user onboarding for your very first users. This list breaks down 20 of the best product launch emails for companies like DropBox and Evernote to show how to effectively connect to your user base. 6 Outstanding Release Notes Examples (And How to Use Each): While new feature releases might be all your team thinks about, users have no reason to care about releases them unless you make them engaging. Here, check out six ways that companies make feature releases accessible and exciting, from companies like Facebook and HubSpot. 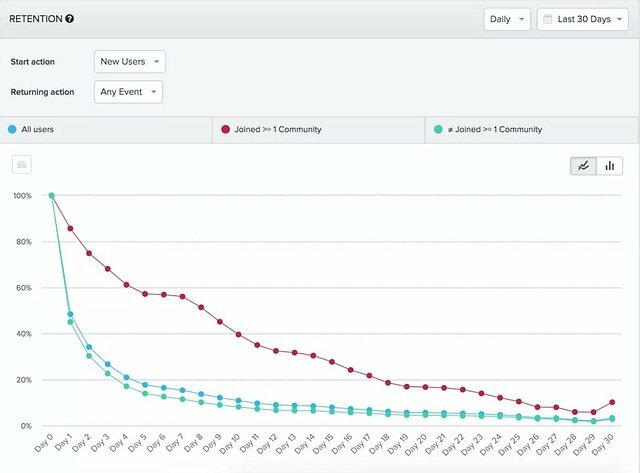 Over the last five years, we've done a lot of research on user onboarding by interviewing customers, running experiments, and surveying the SaaS community. In that time, we've also read up on a ton of data and studies about user onboarding to supplement our own findings.These are the most helpful, research-backed strategies that we've sourced and compiled to inform our best practices. Best Practices for an Effective Product Welcome Page: We analyzed the user onboarding of over 500 SaaS companies to create this resource on building the best onboarding UX. We compiled our findings into nine patterns, with examples for each. Leveraging User Psychology for User Onboarding, Part One: This post is a deep dive into how the principles of consistency and commitment are essential to successful user onboarding. It draws on the findings of two psychologists, Jonathan Freeman and Scott Fraser, whose experiments in the 1960s revealed key insights into user behavior that can be applied to SaaS apps today. A Guide to Proven Customer Retention Strategies: This resource is the result of over 1,200 hours of research and writing. It's one that you'll want to bookmark and return to consistently. The piece contains over 30 links to original articles on user onboarding best practices, so you can take a deeper dive into areas that you want to explore more thoroughly. We Watched Users Browse SaaS Marketing Sites for 1,800 Minutes and Here’s What We Learned: Intuitive navigation can make a huge difference in engaging users and driving retention. To determine exactly how to build straightforward navigation into your product, SaaS entrepreneur Hiten Shah conducted a study of 90 different user interactions on 30 SaaS websites over a total of 1,800+ minutes. This is an excerpt of his report on his findings. Today, companies have an incredible growth advantage by being able to easily learn from leading B2B product designers and marketers. The accessibility of knowledge and experience through blog posts, talks, and presentations within the SaaS community is at an all-time high.We're lucky to be able to learn from these leaders and share them with our community. Here are some of our favorite resources on user onboarding best practices from these experts. 8 Mission-Critical User Onboarding Lessons from 8 Top Product People: We scoped the products with the best user onboarding experiences and reached out to the people responsible to hear exactly how they did it. We asked them a simple question: “What’s the one single most important change you’ve made to user onboarding?” Here are the answers from eight product people at companies like Wistia and QuickSprout. Designing Goal-Oriented User Onboarding in 4 Steps: Lead Product Designer Pantelis Korovilas at Hopper explains the dangers of using product tutorials in user onboarding. He then breaks down four steps to drive your users towards specific actions. 5 Keys to Welcome Emails that Make Rewarding First Impressions: Senior Manager of Product Marketing Janet Choi at Customer.io created this foundational resource for welcome emails. Here are five steps for how to create your onboarding emails to lay the foundation for lasting customer relationships. Double Your Trial-to-Paid Conversions with Smarter User Onboarding: This is a summary of a presentation at Price Intelligently's SaaSFest 2016 in which Rob Walling, the CEO and founder of Drip, explains his four-step framework for improving user onboarding. The piece explains the direct, quantitative results on user engagement and conversion for each of Walling's different steps in his onboarding framework. How to Announce Product Updates: Guest Post by Hiten Shah: Hiten Shah has founded three SaaS companies and has been building web products for over 10 years. In this guide, he outlines specific dos and don'ts for product updates with refenece to his own experiences and those of other SaaS companies he has studied. Onboarding is a progressive process. Your real job is to never stop onboarding—to continue helping existing customers, but also to review the data, iterate, and create an even more seamless experience for your future users. Whether you’re getting to the first aha! moment, encouraging habit-building, or engaging long-standing users, it’s all about experimenting. You need to customize your experience, and that means playing around with the different tools at your disposal. Check out our easy-to-use UI patterns to find the onboarding experience that gets users amped about your product.